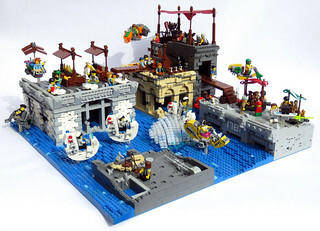 This is my entry into the LSB Battle for District 18 contest, in the Diorama category. This was a really fun build for me, as I have been thinking about this type of scene for quite some time. It is inspired by my time growing up in NYC in the late '70s and '80s, especially Canal Street, as well as my love of the Blues Brothers movie and the chase scenes. The idea was to create a different type of post apocalyptic scene, as some have said...a kinder, gentler survival scene that has very familiar look in a wildly unusual setting. Beside the many speeder bikes, there are also three hover carts ready to sell their wares, and one skyboarder (inspired by Paddy Bricksplitter). Details pictures to come later this evening, thanks for looking!